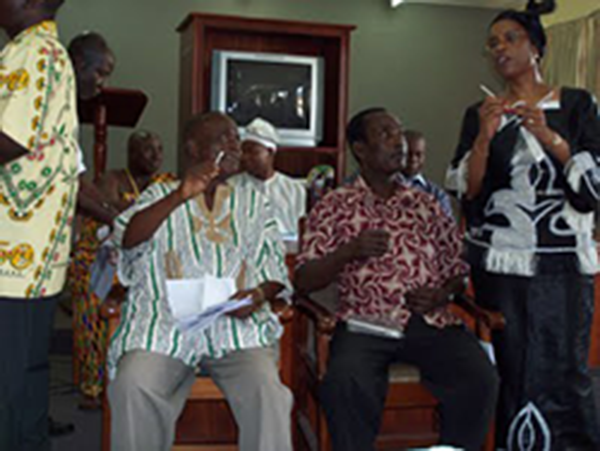 The Sankofa Project was officially launched on October 30, 2009 at the Ghana Public Records And Archives Administration Department (PRAAD). Ghana's Ministry of Tourism official, Mr. Emmanuel V. Hagan, sanctioned the project by noting that Ghanaians don't really understand the pain, hurt and even anger African Americans feel towards Africa because of the slave trade and that "even today, they still deal with the legacy. It is time to do what we can to welcome our brothers and sisters back home." Several hundred samples of DNA were collected from unrelated men belonging to the following tribes: Ewe, Ga, Fante, Asante and Nzema. These Ghanaian tribes were the most active in the selling and trading of Africans into slavery. In addition to CAAGRI's desire to build upon a comparative database of African DNA, we will also record the histories of these tribes: family by family. Our efforts will assist scientist and historians in peeling back multiple layers of ethnic identity for many years to come. The Sankofa Projectis the only one if its kind in Africa and the United States. Our total effort, beginning with the massive collection of DNA samples, is unprecedented. With an office now located at Fort Frederichsburg in Prince's Town, Ghana, CAAGRI will continue to lead the way in Resurrecting History: One Life at a Time. It is the mission of CAAGRI to do everything possible to reunite families disconnected by slavery. Traditionally, this was exclusive of official records, chasing down family myths or interviewing relatives. Science and technology has advanced our genealogy research by leaps and bounds to make it much easier to identify our relatives with a simple swabbing of the cheek. While many African Americans are still discovering distant relatives right here in the United States, there are still those who want to know where their ancestors came from. The challenge has been and continues to be a lack of good sampling from African people in those countries that were colonized. From the 15th through the 18th century, western and central African nations had transported at least 10 million Africans to other continents. This is a commonly accepted conservative number and some historians would argue that the number is probably much larger. Without the use of DNA, the likelihood of finding your distant relatives would be that much more difficult. Our objective is to take the traditional sources and methods of gathering genealogy data and combine it with the advances of science by collecting DNA samples.Prior to the Sankofa ProjectSM, the interest in obtaining samples from African tribes was there but no real effort had been made to go and collect them in large quantities. As such, meaningful, comparative databases for Africans simply remained on the "wish list." It may take several years and thousands upon thousands of samples before families are finally matched by DNA but it is a necessary first step if we are to ever answer that nagging compound question of: "Who am I and Where did I come from? There are no guarantees that every family will be reunited but one thing is certain: we are one step closer today than we were years ago. Ghana was first on the list but there are other Sub-Saharan tribes that played a critical role in the success of the Middle Passage. Be patient, we will get to them too. When we do, will you be ready? Order your DNA kit today!